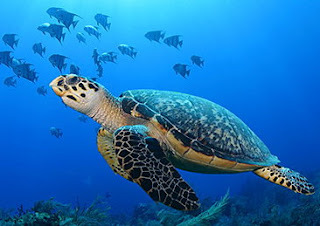 The hawksbill sea turtle is a small to medium sized turtle with shell lengths up to 36 inches. They are known for their beautiful brown shell, mottled with dark and light spots and streaks, which was once commonly used to make tortoiseshell jewelry. 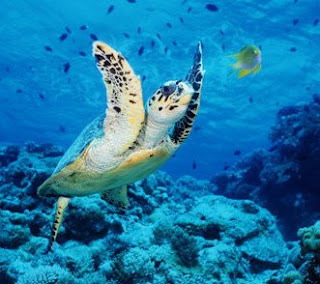 Hawksbill Sea Turtles are the most tropical of all sea turtles. They are found primarily in warmer waters of the Atlantic, Pacific, and Indian Oceans from Japan to Australia and the British Isles to southern Brazil. 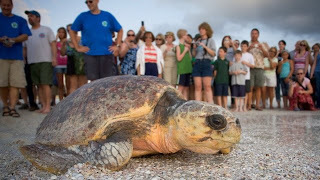 They are also found in the southern waters of Florida, the Gulf of Mexico, and the Caribbean.. Hawksbill turtles nest primarily at night, but there are reports of daytime nesting, usually on uninhabited beaches. Although sea turtles are subject to predation throughout their life cycle, predation is particularly high during the first two years of life. The eggs are eaten by ghost crabs, raccoons, skunks, opossums, mongooses, and dogs. Hatchlings are preyed upon by mammals, sea birds, crabs, and carnivorous fishes. Predation continues to be high until the turtles are big enough to avoid being swallowed. Sharks are a formidable predator throughout the life cycle of the hawksbill. This carnivorous turtle has a highly variable diet consisting mostly of invertebrates such as sponges, jellyfish, crustaceans, sea urchins, and molluscs. In captivity, adults reach sexual maturity between 3 and 5 years of age, although wild turtles may take much longer to reach maturity. They can live as long as 30 - 50 years. Adults mate off the nesting beaches every 2 to 3 years during the nesting period, generally April through November. Female hawksbill turtles nest alone or sometimes in small groups. As with other sea turtles, females return to lay their eggs on or near the same beach where they hatched. Scientists believe that sea turtles navigate by using their own innate global positioning system. Hatchlings are born with the ability to navigate using the earth's magnetic field. The females may nest several times during a season, laying as many as 200 soft, round white eggs per nest. The eggs incubate in the sand for 47 to 75 days. The incubation period is longer when the weather is cool. Hatchlings emerge from the nest mostly at night, race quickly to the surf and swim hurriedly toward the open ocean. Nesting occurs in numerous places in the tropics. In the Americas, these include the beaches of theYucatan Peninsula, southern Cuba, Costa Rica, islands of the Caribbean such as Virgin Islands, Jamaica, Dominican Republic, Turks and Caicos, and Grenada, northeastern Brazil, and Pacific coasts of Mexico and Panama. 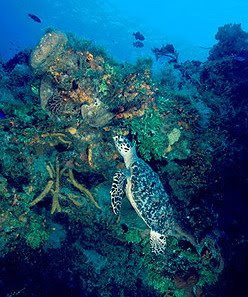 Hawksbill Sea turtle's, are omnivorous and have a widely variegating diet. Their diet consists of small sea grasses and plants found in different ocean depths and includes invertebrates, such as crustaceans, jellyfish, mollusks, sea urchins and sponges. WARNING: IF YOU GIVE A HOOT, DO NOT POLLUTE. At times these beautiful creatures mistake balloons, debris and plastic material pieces as food. This can in turn lead to a wide range of illness in these turtles or even death. Hawksbill sea turtles are found primarily in warmer waters of the Atlantic, Pacific, and Indian Oceans from Japan to Australia and the British Isles to southern Brazil. They are also found in the southern waters of Florida, the Gulf of Mexico, and the Caribbean. 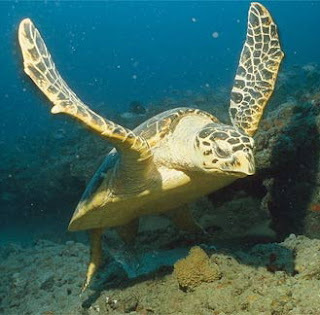 In Texas, the hawksbill is found in the Gulf of Mexico and occasionally on the Texas coast. The hawksbill's brightly colored, thick scutes covering the carapace (top of the shell) are the source of "tortoise-shell" which has been used for centuries to make jewelry. Handicrafts made of tortoise-shell appear in many ancient cultures, in places like China, Ceylon, India, Oceania, and Rome. With the CITES (Convention on International Trade in Endangered Species) restrictions, international trade in tortoise-shell has significantly decreased, but harvest of the turtle for its shell is still a threat to its survival in some areas of the world. The meat and eggs of the hawksbill have long been a source of food for people, although the meat is considered toxic in some areas due to the food items consumed. Human exploitation of the nesting grounds and pollution pose long term threats to its survival. 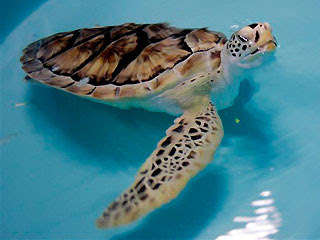 In the past, hawksbill sea turtles were often killed in large shrimp trawl nets. Today, turtle excluder devices (TED's) pulled by shrimp boats help reduce mortality from net entanglement. In captivity, adults reach sexual maturity between 3 and 5 years of age, although wild turtles may take much longer to reach maturity. Adults mate off the nesting beaches every 2 to 3 years during the nesting period, generally April through November. Female Hawksbill turtles nest alone or sometimes in small groups. As with other sea turtles, females return to lay their eggs on or near the same beach where they hatched. The females may nest several times during a season, laying as many as 200 soft, round white eggs per nest. The eggs incubate in the sand for 47 to 75 days. The incubation period is longer when the weather is cool. Hatchlings emerge from the nest mostly at night, race quickly to the surf and swim hurriedly toward the open ocean. Nesting occurs in numerous places in the tropics. In the Americas, these include the beaches of theYucatan Peninsula, southern Cuba, Costa Rica, islands of the Caribbean such as Virgin Islands, Jamaica, Dominican Republic, Turks and Caicos, and Grenada, northeastern Brazil, and Pacific coasts of Mexico and Panama. The Hawksbill's brightly colored, thick scutes covering the carapace (top of the shell) are the source of "tortoise-shell" which has been used for centuries to make jewelry. Handicrafts made of tortoise-shell appear in many ancient cultures, in places like China, Ceylon, India, Oceania, and Rome. With the CITES (Convention on International Trade in Endangered Species) restrictions, international trade in tortoise-shell has significantly decreased, but harvest of the turtle for its shell is still a threat to its survival in some areas of the world. The meat and eggs of the Hawksbill have long been a source of food for people, although the meat is considered toxic in some areas due to the food items consumed. Human exploitation of the nesting grounds and pollution pose long term threats to its survival. In the past, Hawksbill Sea Turtles were often killed in large shrimp trawl nets. Today, Turtle Excluder Devices (TED's) pulled by shrimp boats help reduce mortality from net entanglement. Population Estimate*: 22,900 nesting females. 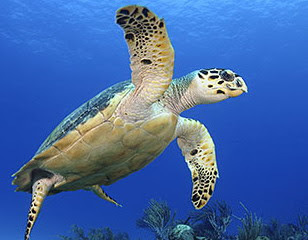 Hawksbill turtles live in clear offshore waters of mainland and island shelves. They are more common where coral reef formations are present. Hawksbill turtles nest on sandy beaches, often in the proximity of coral reefs. Scientists believe that sea turtles navigate by using their own innate global positioning system. Hatchlings are born with the ability to navigate using the earth's magnetic field. Note: Special thanks to the photographers for providing images of Texas endangered and threatened animals. 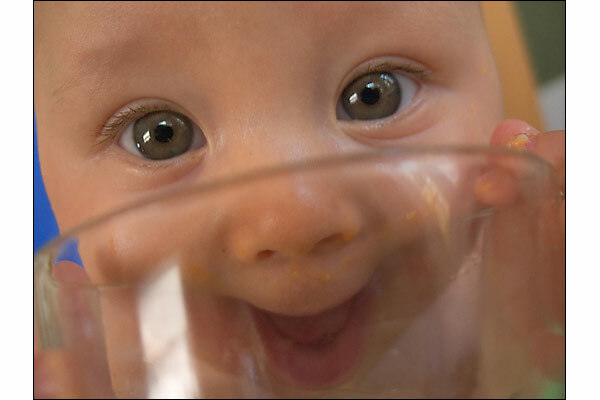 All rights to these images are reserved. Educational use permitted. Bonham, C.D. and A. Lerwick. 1976 Vegetation changes induced by prairie dogs on shortgrass range J. Range Manage. 29(3):221-225. Davis, W.B. 1974 Atlantic Hawksbill Sea Turtle Texas Parks and Wildlife Bull. 41. p. 101-102. Forrest, S.C., T.W. Clark, L. Richardson, and T.M. Campbell III. 1985 Atlantic Hawksbill Sea Turtle habitat: some management and reintroduction considerations Wyoming BLM Wildlife Technical Bull. No. 2. 48pp. Texas Parks and Wildlife Department. 1991 Black-footed ferret reintroduction evaluation status survey Final Section 6 Report. Project No. E-1-3. U.S. Fish and Wildlife Service. 1988 Black-footed ferret recovery plan. Denver CO. 154 pp. Whicker, A.D. and J.K. Detling Ecological consequences of prairie dog disturbances. BioScience 38(11):778-785. Hi Angelica,thank you for your kind words,but believe me,the blog is closed.It makes no sense to carry on when the interest is gone - that's why I pulled the curtain,I felt it wasn't funny anymore. Please do accept my best regards. By the way,I won't delete it from Blogger,it just won't be updated anymore. Nice post. Hope will raise the awareness against our nature. Moreover to the global issue "climate change"
The pics lOoks good, great job on those YAY!! 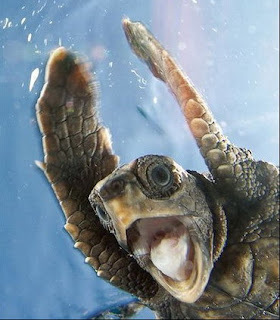 Turtle is a symbol of wealth, and that creature has an incredible life.